CSP runs two Balwadi units – now located in the Dover Terrace premises at 17B/1A, Dover Terrace. In the CSP Balwadi programme, basti children between 2 and 5 years experience their first introduction to any kind of learning processes and receive pre-primary education. The stress is on building up the attendance habit, and participation in class, aimed to build a child’s attention span, and instil in them a habit of attending school. 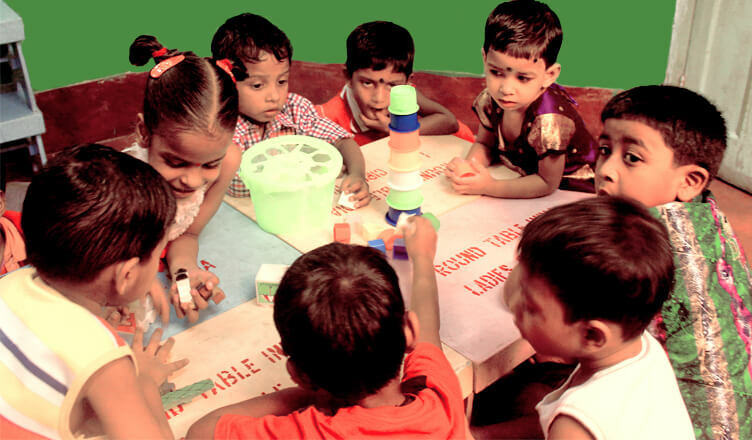 Group activities are stressed for moulding the child to function as a member of a group and ready him for the process of learning, inculcating basic hygiene and discipline, manners and behaviour. An informal learning process ( “ joyful learning method“ ) is followed through nursery rhymes, familiarisation with shapes and colours through songs, pictures and toys. They are also taught to participate in recreational activities, recitation, song, dance, art and craft. Each unit is in the charge of a trained attendant along with a helper. Basic nutrition is also provided to the children through cooked meals as per the Government of India’s “Integrated Child Development Scheme” (ICDS) norms. The Balwadis are linked to CSP’s Primary School in Dover Terrace – admission into which begins their formal schooling, and serves as a springboard to secondary education.